It's a new decade. We shall call it Twenty-Ten. Do not give into the temptation to call it Two-Thousand-Ten. One extra syllable will ruin your life. Recently, New York Magazine featured "Rust in Peace" an article listing items considered obsolete at the end of the naughts. Here are a few of those, plus some bonus Jonas. 1. 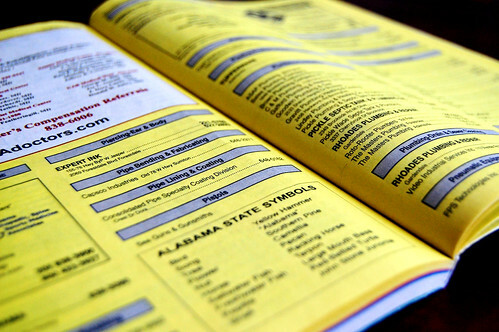 Yellow Pages: You see it on your porch or in your mailbox and you sigh. Door stop. 2. Foldable Road Map: My father loves poring over intersections and scales and creases that fall on state lines. But now we have access to satellites that can get us lost. Who needs paper? 3. Film Cameras: Talk about a leap of faith. How can you take a picture that you can't instantly delete? 4. Answering Machine: Do folks still have landlines to plug into these boxes? 5. Encyclopedias: I read and re-read about the wedding of Princess Di and whats-his-name in my 1981 Brittanica. Now, Wiki garners all my attention. 6. Floppy Disk: It wouldn't hold one Kelly Clarkson song. Ergo, useless. 7. Newspapers: I love The Birmingham News. Online. I actually have weekend delivery, but that was for the comics umbrella and coupons. 8. Rolodex: I have one. Very vintage. And unused. 9. Cassette Tapes: I sorta miss the art of fast forwarding and rewinding. And the thrill of randomly stopping at the beginning of a song. 10. Handwritten Anything: It's unfortunate, but I keep up with folks by lurking outside of their Facebook profiles. I expect them to do the same. Any other outdated items still wandering about? Want to challenge the list? There was a massive stack of new yellow pages downstairs yesterday morning. I thought to myself, "Really? Still?" I was in a "mixtape club" about 5 or 6 years ago, and we all swapped mixes on CD, but there were a couple of old school purists who insisted on making cassettes. p-b: I want to be in a mixtape club. Now. #3: oh yes, a challenge is forthcoming here. #10: Handwriting is on its way back on. See p-b's new year's post. I think honestly and seriously analog items are appealing to me because so much of my life is centered digitally now. So these throwbacks make me feel more grounded. I'm still tweeting, FBing and emailing a lot. But film, a phone that doesn't rely on a signal or electricity and the tactile feel of a handwritten note do soothe me. JN: Fabulous response! I wish I could be cool and analog-y, but I would glue a keyboard to my forearm and call it a day. HNY to you too! CD's are practically gone too...most people use ipods/mp3s now! Great list! But I HATE when the yellow pages/white pages get dropped on the doorstep...they get carried right thru the house to the back door and dumped in the trash can...it annoys me, and I hate that its such a waste of paper!! oh, and i would add CDs to the list...it wont be long till they're comepletely outdated! ours are under the bed in a box...probably destined for the thrift store! I will say that there is a small-ish comeback in using real film and digital, at least in wedding photography. its trendy and gives some of your shots a vintage look, while still having the security of all the digital images. AM: I keep my CDs too JUST IN CASE. Of what, I don't know? You're right about the film...I notice friends who dabble who are backtracking to the real stuff.